Contrary to popular belief, ottomans were not named after the Ottoman Empire. Ottoman refers to a broad category of footstools or small benches that are fitted with a padded top. Ottomans are usually used at the foot of a chair or placed toward the front of a sofa and are most often used as a foot rest. They come in many shapes and sizes, and can be covered in many different fabrics, including leather. Round ottomans offer a softer design focus than square or cubed ottomans and can be placed in smaller areas of a room to create an intimate atmosphere. Pairing a round ottoman with a curved sofa will lend a contemporary flair to a room. You can offset harsh angles and square corners in a room by adding a round ottoman. Round ottomans are generally smaller than other ottomans and range from 15 to 23 inches across. In addition, sometimes round ottomans have wheels on the bottom, making them portable. 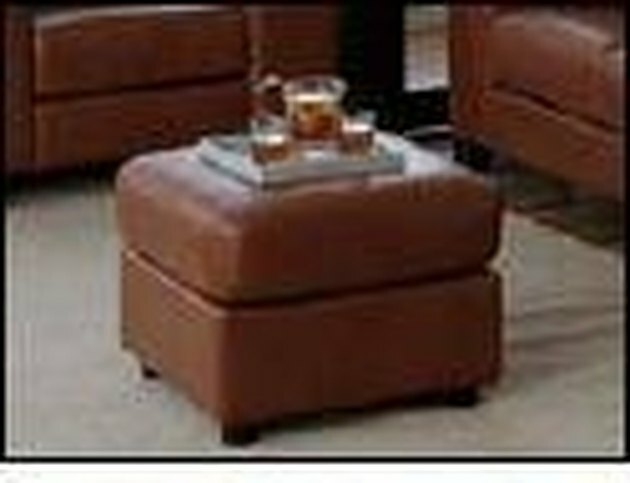 Choose a square or cubed ottoman if you are looking for storage and flexibility. These styles make excellent companions to upholstered pieces in a room and can either match the existing upholstery or complement it. If you are looking for a suitable alternative to a coffee table, try putting two cubed ottoman close to each other and then top it with a large tray. This make for a functional and practical design element. For even more practical features, pick an ottoman that has a hinged top with a storage area inside. Square ottomans come in many sizes and range from 15 inches square for a basic foam cube to more than 20 inches per side. Because of the combination of storage capability and a large surface area for display, rectangular ottomans can often take the place of a traditional coffee table in the living area. If you have a large enough space, a rectangular ottoman is most often the best choice for design and function. Rectangular ottomans are typically the largest available, with some sides measuring as long as 40 inches. The average height for an ottoman is roughly 16 inches. Ottomans are covered in a variety of fabrics, with leather being a popular choice. Leather is extremely durable, and resists staining, tears and ages well. It also offers a soft, pleasant surface that fits into many design schemes. Black leather, tufted ottomans create a strong focal point in a large room, especially if the rest of the color scheme is muted. This style will also be in fashion for a long time. For a smaller room, you might want to consider a more subtle color in the beige or taupe family. Picking out a fabric to cover an ottoman can be more of a challenge. You might want to match it to an existing sofa, or the window treatments in the room. Another option would be to sew slipcovers for the ottoman that could be rotated with the seasons. You could also match the fabric on an ottoman to pillows you use on the sofa. Rattan ottomans suggest a more casual, relaxed look and will complement many styles. These ottomans can be square, round or rectangular. They are lightweight and can be easily moved from room to room, and even used outside on a patio. Painting a rattan or wicker ottoman is an easy way to personalize it and create a custom look for your home. Make sure you keep your rattan ottoman away from harsh sun and rain to ensure a long life. With all of the design options available for choosing an ottoman, it can be confusing deciding which one will work best in your home. Take into consideration the size of the room you are decorating, who will be using the ottoman, and what purpose you would like the furniture to serve. Work with an interior designer to get ideas on selecting the most appropriate ottomans for your home, and once you pick one or two out, put your feet up and relax.